"With his dead eyes, ashy skin, slicked-back grey hair, dingy track suits and sagging slacks, Bulger might be a gangster ghoul. The film treats him as a literal monster, often silhouetting him or veiling him in darkness or partial shadow. One shot pictures Bulger from overhead, lying on a couch and staring unblinkingly up at the ceiling while the camera zooms out slowly: it's the way you'd photograph Dracula chilling in his coffin [...] Touches like these make "Black Mass" feel less realistic than expressionistic—like Scorsese's remake of Cape Fear which envisioned ordinary people being terrorized by a diabolical ex-convict who seemed as unstoppable as Michael Myers in Halloween or the Terminator, or the original silent-film bloodsucker Nosferatu, who could paralyze mortals by looking into their eyes." The allusions to Dracula and F.W. Murnau's Nosferatu in Seitz's review inspired me to create this video mashup. 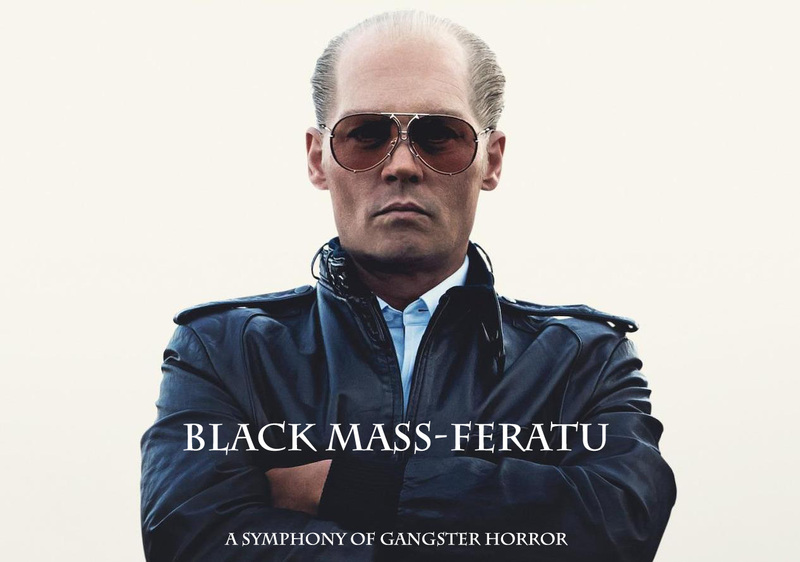 BLACK MASS-feratu: A Symphony of Gangster Horror from Nelson Carvajal on Vimeo.